Although marijuana is now legal in Colorado, I don't see any particular attraction to mile markers from this state, as US mile markers are pretty standard--at least along interstate highways (where this photo appears to have been taken). 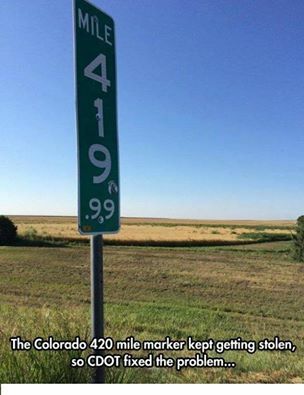 *The claim suggests that there is a single mile marker 420 in Colorado, which is clearly false, as, even if there is only a single (Interstate) highway long enough to have a mile 420, there would be one marker on each side of the road, one for east-bound traffic, one for west-bound. Newspaper journalists aren't always the most reliable of information sources, but a direct interview with someone who appears to have the appropriate expertise and authority is the best I would expect to find on this topic. They also include a second (uncredited) picture of the sign suggesting it isn't a simple photoshopped meme, but an extant sign. Historical street view shows a 420 sign on I-70 Westbound in September 2011. Not the answer you're looking for? Browse other questions tagged united-states theft . Did no citizen of countries banned by Trump's executive order kill any american since 1975? Did Trump replace Joint Chiefs of Staff & Director of Natl. Intelligence with Steve Bannon? Did Hillary Clinton destroy phones with a hammer? Did Mormons protest social issues with the American flag in 1885?